I used to be annoyed by the word "consolidation." It was on a short-list of market jargon words that were overused and possibly nebulous. But over the years we've become friends. If it has annoyed or confused you, give it another chance. You might just find a new friend. I'm not sure what kind of market terminology glossaries there are out there, but I can make it easy for you with one synonym: REGROUPING. The word "regrouping" sounds kind of weird as a noun. Otherwise, I think it's an even better term than "consolidation." Either way, we're talking about markets moving sideways after a rally or sell-off. Oftentimes, the sideways movement initially takes the shape of a push back against the previous move (i.e. a sell-off gives way to a nice little bounce, and a rally gives way to a bit of selling)--hence the appearance of "correction" as a frequent pinch hitter for "consolidation." But this correction is usually only acting as a set-up for the boundary lines that will mark the consolidation. The only really tricky part of the definition (because "regrouping" is a bit nebulous too) is that it might or might not imply a gradual tightening of the trading range. I would guess 95%+ of time, I use the word "consolidation" to refer to such a tightening. When do we see them? Consolidations can come at any time for any reason, but they're frequently seen at the end of strong moves. Markets are (you guessed it!) REGROUPING and considering their strategy for the next wave of momentum. In that sense, a consolidation marks a period of indecision or inactivity following something that had been more decisive and active. From a pure tradeflow standpoint, a consolidation could be as simple as traders booking profits or exiting positions for some calendar-related reason. Alas! We finally come to the point for today. Thanksgiving = "calendar-related reason." 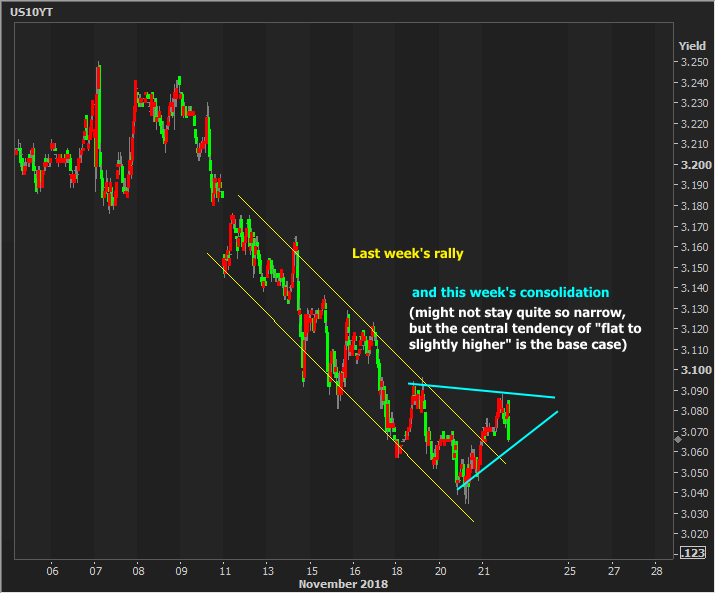 Given last week's strong run and yesterday's unwillingness to extend the run despite endorsement from stocks, it became more likely that we were seeing a consolidation take shape heading into Thanksgiving (hence a title like "More Evidence For a Defensive Shift in Lock/Float Stance" in yesterday's MBS Huddle). Unless something very big happens today, this consolidation is in the books. Traders are already making their way for the exits, virtually or otherwise, and we'll be waiting until next week at the earliest to see a representative sample of new trades. That doesn't mean bonds can't move outside this consolidative range--simply that any such move is not necessarily indicative of what waits for us on the other side of the holiday. Best explanation I have heard regarding consolidation. Thank you for that!